Our Maryland estate planning lawyer compiled these frequently asked questions about estate planning. If you would like to set up a free consultation with our Maryland trust attorney, please call us now. Your estate is made up of your real and personal property, insurance proceeds, investments, and other tangible and intangible property. Estate planning involves the development of a strategy for the preservation of property during life and the distribution of property after death. If you fail to create your own estate plan, the state will create one for you. Adams Law Office, LLC is a suburban Maryland and Washington, DC metropolitan law firm assisting clients with the development of a plan for the distribution of their property after death through individualized advice and preparation of applicable documents, such as wills, trusts, powers of attorney, and advance healthcare directives. A revocable living trust (“RLT”) is a separate entity created for holding title to property for the benefit of a beneficiary. A revocable living trust is just that – revocable and changeable by the person who created it. With an RLT, you, the property owner are the Settlor, who creates and can amend the trust, the original Trustee, who manages and distributes the property held in trust, and the beneficiary until death, at which time, a Successor Trustee transfers the property to the successor beneficiaries. Control over the property remains with the owner(s) during life and the transfer of property after death occurs without probate. If you have property in more than one state, a trust can eliminate the need for probate proceedings in multiple jurisdictions. Also, if your estate, including life insurance, is sizable and over the estate tax exemption amount ($5,250,000 in 2013), a revocable living trust for you and your spouse can save your beneficiaries tens of thousands in estate taxes. In addition, a trust can allow for great specificity with regard to distributions for beneficiaries, asset protection, retirement plan distribution planning to limit income taxes, provisions for special needs children, blended family planning, and provisions to prevent guardianship. What is probate and should it be avoided? Probate is the process by which a court supervises the distribution of probate property according to a verified will or the laws of intestate succession. Probate property generally includes assets owned individually. The primary reasons for avoiding probate involve the costs and time associated with the process. In Maryland and DC, for small estates, the actual court costs and probate fees involved are nominal and the probate process is more streamlined than in the past. For many estates, a valid will and individualized planning can minimize the impact of the probate process. 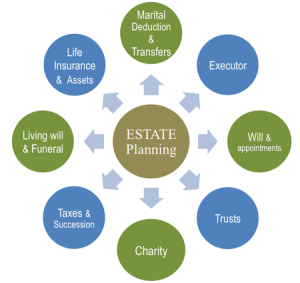 However, estate plans effectively utilizing a trust can avoid probate altogether and allow for distribution of assets without court involvement or delay, keep the estate plan private, minimize and/or delay estate taxes for estates with assets (including life insurance) over the estate tax exemption, provide for assets to be held in trust and distributed over a period of time, and can allow for the management of assets if necessary due to incapacity.